Removable drives are backup destinations that are externally connected to your computer. For example, external USB Hard Drives and RDX drives. This section explains the removable media options available when you edit a System Protection backup job. Once you have created a backup job, you can modify its settings using the Manage screen's Edit option. This allows you to change selections that were made when the job was created. There are also options that are not available when you create a backup job. Select the backup job that you want to change. There are 8 standard Edit options, similar to the steps completed during the backup job creation. There may also be backup specific options. Below is a list of the sections and options available. What you see in BackupAssist will depend on the backup job's current settings. Specify the drive letter from the drop-down menu. Drive letters that correspond with external drives should be automatically detected. If the drive does not appear or you have just connected the drive click Detect. If it still does not appear you can input the drive letter manually (ie. J:\ ). Enabling hard drive eject acts to safely remove/disconnect your drive from Windows. If the drive is not safely ejected in this way, you risk corrupting or losing data on the drive. Hard drive eject also ensures that data on your external drive is not overwritten the next day. This is useful if the drive is connected to the machine but shows as a different drive letter to that in BackupAssist. 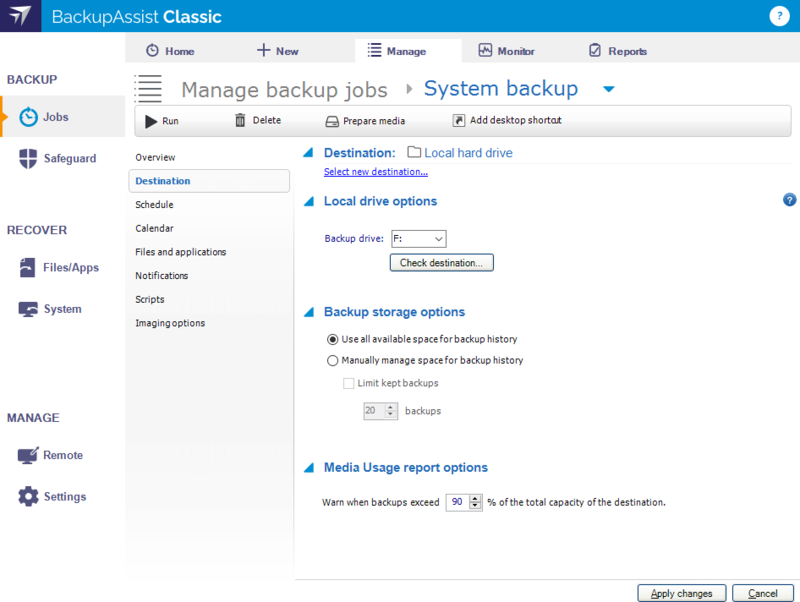 If the drive has been prepared for use with BackupAssist, BackupAssist can detect the drive and create the backup on it. This means you can have multiple external drives connected to the machine at the same time, and provided each drive has been prepared, the backup will be created on the correct drive, regardless of the letter assigned. A Data container is an image file that backups can be stored in. It is selected as a Destination media option during the creation of a backup job. It can be given a set size or allowed to use all available space on the backup destination. This option is available if you select Local Hard drive as your backup destination. You can select where the Data container will be created, using the Path on drive field. The Data container's size setting can only be modified if there is no Data container. For example, if the backup job has not yet been run (therefore the container has not been created), or if the Data container has been manually deleted. The size setting for the Data container can be changed using the up and down arrows in the Container size (GB): box. The Use all available space tick box can be used instead of manually setting the size. By selecting this option, all available space on the destination device will be used by the Data container. Up to 2TB for Windows Server 2008R1/R2 and up to 64TB for Windows Server 2012R1/R2. Selecting Check destination will create and test-mount the Data container. The results of the test can be viewed by selecting the Report link. The categories listed for the types of disks you can specify (daily, weekly, monthly, etc) depend on what rotation scheme you have selected in the Scheduling section of your job. For each backup type listed (daily, weekly, monthly, etc) specify the number of external disks you have available. It is recommended that you have at least two drives of each type to allow for rotation of media and offsite archiving. For example, if you had selected the Daily + Weekly + Monthly Rotating Full scheme we would recommend you purchase at least 6 external drives. Having multiple drives will ensure that your data is well protected in the event of disaster and that you have a large archive of backups to restore from. After setting the number of external hard drives in your backup pool you can specify a date for when your media rotation should commence. This is useful if you have more than one weekly drive as it will determine how the drives are rotated. For example, if you had two weekly drives and set the start date to 5-Mar-2016, the Week 1 drive would be used on 5-Mar-2016, and the Week 2 drive would be used on 12-Mar-2016. The following week, 19-Mar-2016, would use the Week 1 drive, and you would continue to rotate the two weekly drives for each subsequent week. To specify a start date choose a calendar date from the Start the first week of backup on this date drop-down menu. BitLocker is a Microsoft encryption solution that is supported by BackupAssist for System Protection, File Protection and File Archiving backups to removable drive destinations. An encryption key is a file that can be used to unlock a specific encrypted drive. The BitLocker encryption key location is used to identify the USB flash drive that the BitLocker encryption key is saved to. You can use the Detect option to identify the drive, or use the drop down list to select the drive letter that has been allocated to the USB flash drive. Each time an external drive is encrypted (prepared), a BitLocker encryption key will be created. The USB flash drive must be connected so the encryption key can be saved. When the USB flash drive is connected, the encryption key will allow access to the corresponding encrypted external drive, so that you can restore data from any of the backups on that drive. When an encrypted drive is attached to the server, it will be locked until it is manually unlocked using a password or by a backup job using the encryption key on the USB flash drive. After a backup job has run and unlocked an encrypted drive, that drive will remain unlocked until the drive is detached or the server restarted. If an encrypted drive is LOCKED when the backup job runs, the USB flash drive containing the encryption key MUST be connected to the server running the backup job. If an encrypted drive is UNLOCKED, the external USB flash drive is not required. The Password for encrypted backup drive field is used to provide a password that will allow access any external drive that was encrypted by this backup job. The password is saved as a part of the backup job. This password MUST be provided if you want to use this backup to perform a RecoverAssist recovery. Entering the password will allow RecoverAssist to access the encrypted external drive that the backup is on. The password OR the USB flash drive containing the encryption key, can be used to access a BitLocker encrypted drive when you use that drive to perform a restore. Use all available space for backup history. This is selected by default and is the recommended setting. Manually manage space for backup history. You can select this option if you are experiencing problems with your backup history. If you are using Windows Server 2012 or Windows 10 and later, this option allows you to select Limit kept backups, so you can select the number of backups you want to keep. Limit kept backups should only be enabled if you need to keep a certain number of backups, or if you have experienced VSS issues on the backup destination. The number of backups to keep will depend on the amount of free space at the destination and how much free space is used up each time a backup job runs. If you are on a Windows Server, you will also have a link to Launch Shadow Storage Manager. Selecting this will launch the Windows Server Shadow Copies manager. Only the Settings options should be reviewed for destination drives. Ensure that the Maximum size is set to Use limit with enough space for your backup history needs. We do NOT recommend using No limit. Instead, if you want to use all available space on the drive, you should enable the BackupAssist Use all available space option. You should also not use the Enable or Disable buttons or Next Run Time option. Warning: This is a Windows Server application. 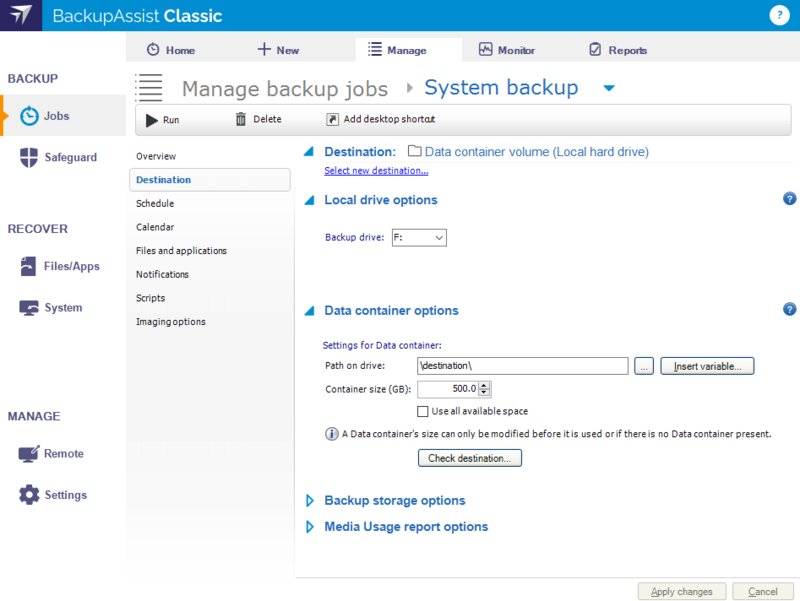 It is not a part of BackupAssist and is not supported by BackupAssist. Shadow Storage Manager should only be used by someone experience with advanced Windows storage settings. If you create a System Protection bare-metal backup on an external USB hard disk, the media can be made into a Bootable Backup Media. The backup media can be used to boot into a RecoverAssist recovery environment and recover the server, without a separate boot disk. The backup media will be made bootable the first time the job runs unless you deselect the Make media bootable with RecoverAssist tick box. When creating a backup job, selecting Prepare on the Prepare media step will generate a Destination Check Report. This report will advise if the backup media cannot be made bootable. After you run the backup job, the backup report’s Recovery section will note if the backup media was made bootable or if the boot information was updated. If the media is not bootable, you will need to run the RecoverAssist builder, to manually make the backup media bootable, or make a separate, standalone RecoverAssist media. This involves checking if your external drive media has been prepared for use with BackupAssist. 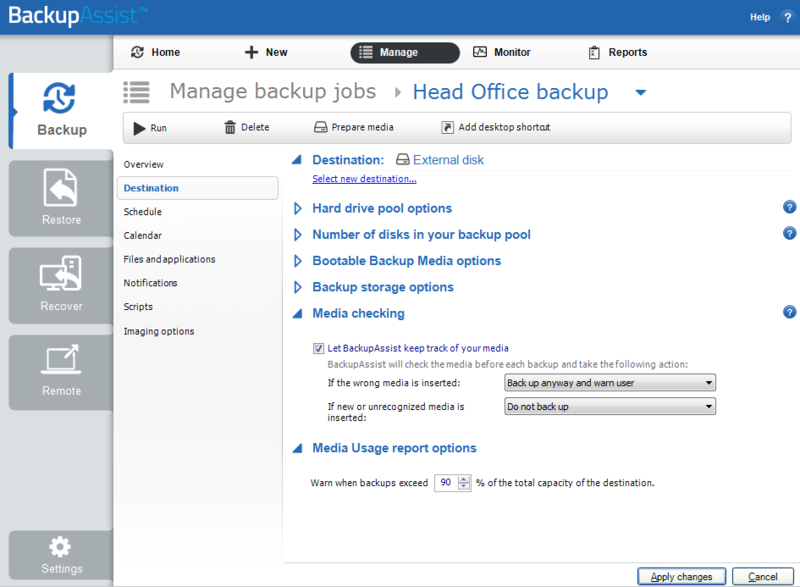 If the media has been prepared, BackupAssist will determine if the label for the media (eg. Monday 1, Month 1, etc) is correct according to the rotation scheme selected and that the media required for that day (ie. that Monday's drive) has been connected to the machine for Monday's backup. 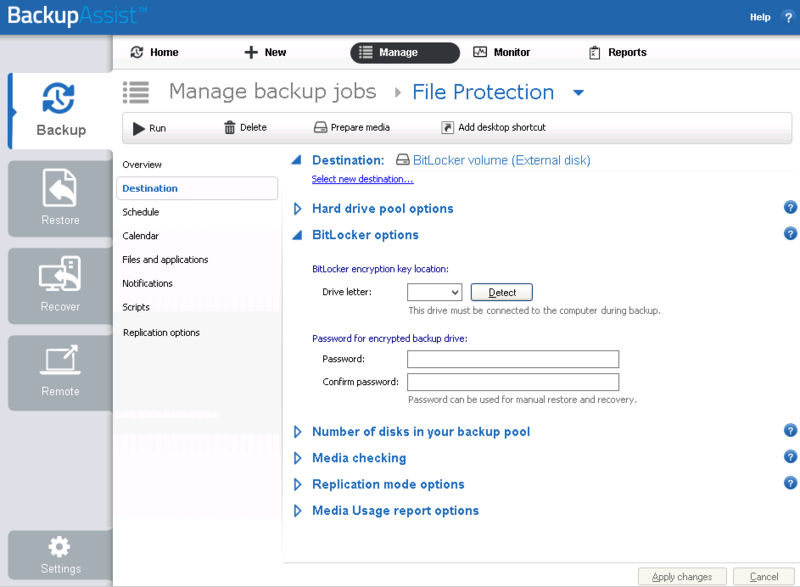 BackupAssist can be configured to take different actions depending on whether unrecognized or unprepared media is detected, or if the wrong media has been inserted for that day (eg. Tuesday's drive is connected on a Wednesday). 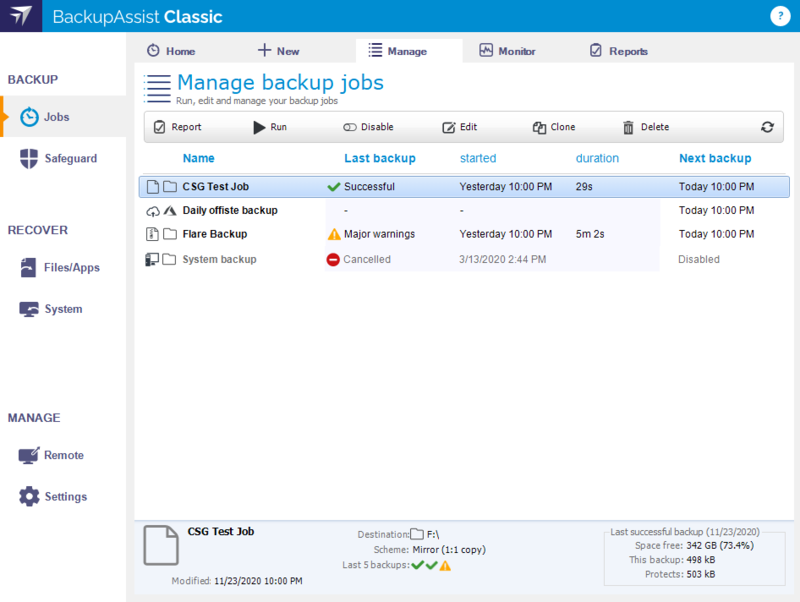 Backup anyway and warn user: BackupAssist will attempt to back up to the incorrect media and add a warning to the backup report to inform you that incorrect media was detected. This option is recommended as it is preferable, in terms of data protection, to have a backup to incorrect media than no backup at all. Do not backup: BackupAssist will not perform a backup to the incorrect external drive and you will receive a message in your backup report indicating that the backup did not take place because of incorrect media. 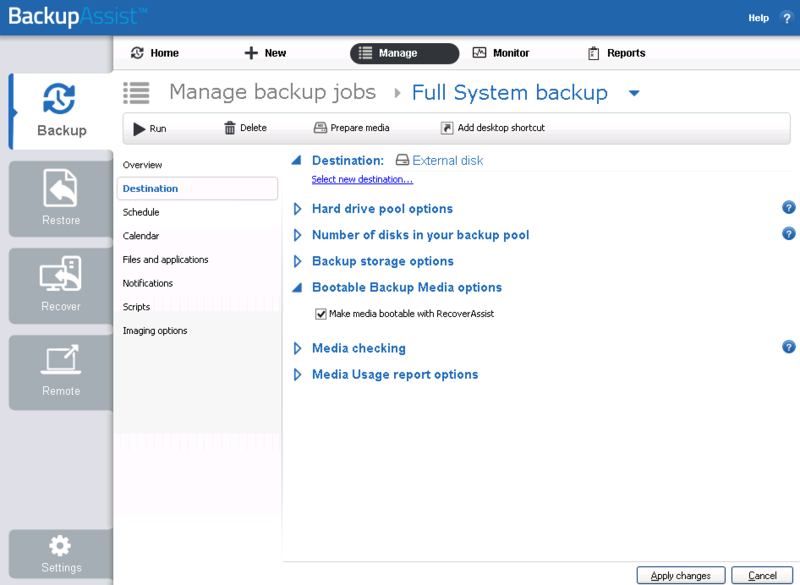 Back up and warn user: BackupAssist will attempt to back up to the unrecognized or new media. A warning will be added to the backup report to inform you that unrecognized media was detected. You will need to prepare the external drive to avoid this warning in future. 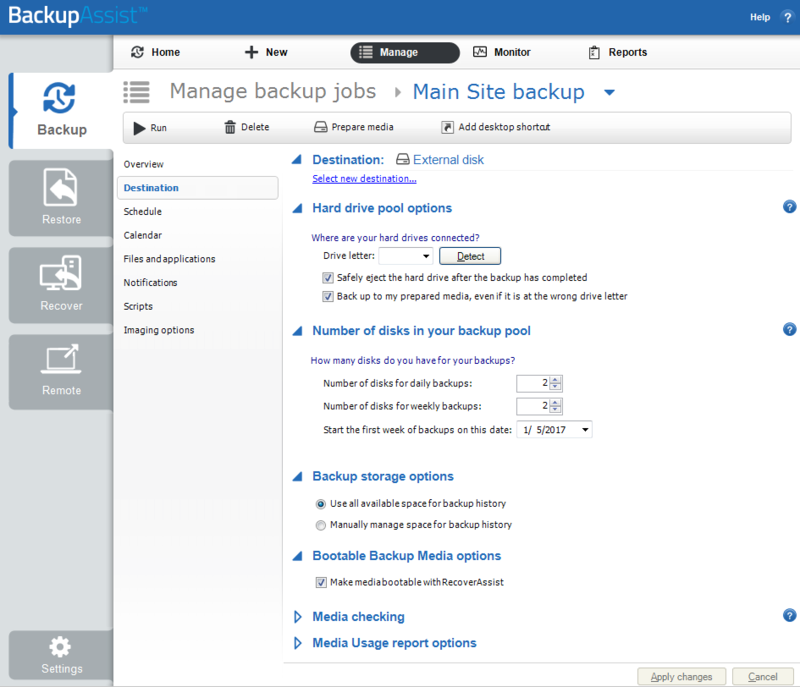 Do not back up: BackupAssist will not perform a backup to the unrecognized external drive and you will receive a message in your backup report indicating that the backup did not take place. You will need to prepare the external drive to ensure that the backup is attempted in the future. The media usage report is part of the overall report generated for each backup. It outlines how much disk space has been used by backups on the backup destination and how much free space is available using totals and percentages. Depending on the destination you are backing up to as well as the number of backup sets that are present, the media usage report can take several minutes to generate. The Warn when backups exceed [90%] of the total capacity of the destination setting allows you to set a threshold that will add an additional condition to the backup report if the backup usage goes over that value.